The Motorola Photon 4G will spark a little interest with Android fans, here we have the release date, price, specs and a few details about the smartphones accessories you can also get as well, we hope you like. Thanks to Sprint ID they have just added its amazing list of features for the stunning Motorola Photon 4G smartphone, this is Sprints first global 4G handset that comes packed with cool features. The Photon 4G will release to stores July 31 and will have a price tag of $199.99; this excludes taxes and does require a new line or eligible upgrade and two-year service agreement. If customers signed-up to receive notifications from Sprint, you will get details on July 28, premier customers can now log on to their accounts on Sprint’s site on July 28 and then click “show me my rewards” and then “Sprint Premier Community” for additional details. The 1GHz dual-core processor handset will bring 4G technology to the table and will get rich Sprint ID features such as apps, shortcuts, widgets, wallpapers, ringtones, all it takes is a few little clicks and customers can choose what they want. The Sprint ID packs are totally free and can be downloaded with an Everything Data plan, users can have up to 5 downloads at once and this includes professional features such as travel plans, organization, communication, green tips to live a greener lifestyle, MTV Music ID, HSN, NASCAR Sprint Cup Series ID Pack and many more. 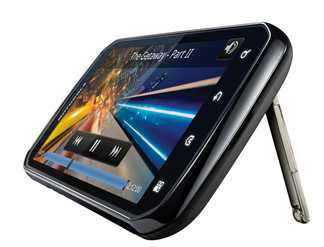 Motorola Photon 4G Main Features Include: Android 2.3 Gingerbread, Motorola webtop application, 1GHz (1GB of RAM) Dual-core NVIDIA Tegra 2 processor, 4.3-inch touchscreen with qHD, 8-megapixel dual-LED flash camera with front-facing webcam and VGA front-facing camera for video chat, 16GB internal storage, plus support for up to 32GB SD Card giving a total of 48GB, Worldphone capabilities, 3G/4G Mobile Hotspot capability (Supports up to eight devices) and much more. The Motorola Photon will come with many accessories that will be exclusive, paired with the HD Station, which includes a Wireless Remote and HDMI Cable, users can do more than ever on a larger screen. When docked, the Motorola PHOTON 4G launches the Webtop application, providing users with instant access to full FirefoxÂ® multi-window browsing capabilities. Additionally, users can connect up to three USB peripherals, such as a keyboard, mouse or memory stick to be even more productive at home or on-the-go. The HD Station will be available when the device launches for $99.99 (excludes tax). You can also buy the full-size Wireless Keyboard for $69.99 (Excludes Taxes), great for app access and quick typing. There will also be the ‘Vehicle Navigation Dock’ for $59.99 (excludes tax); this is fantastic if you travel a lot because it features easy access to maps, hands-free calling, favourite contacts, and turn-by-turn navigation. It has integrated Motorola ESP technology to automate the screen preferences as well as giving users the ability to stream audio & music via the 3.5mm audio jack through the vehicle speakers. There will also be the ‘Battery Only Charger and Battery Bundle’ for $49.99 (excludes tax), this will release August 21. This is a 1700mAh Lithium Ion replacement battery that gives users more power and life. There will also be many cases and skins for the Motorola PHOTON 4G, as well as ‘Holster and Shield Combo’ for $24.99 (excludes tax). protective Gel surrounds Motorola PHOTON 4G like protective gloves with precision cut-outs for access to the device’s bright screen, control buttons and keypad. It’s available in purple and retails for $19.99 (excludes tax). Two-piece phones covers that will come in gray with black leather inlay for $21.99 (excludes tax) will also be released. For more information about Sprint 4G please visit here, just a little extra for readers: Starting on July 18, register at shopmotorola.ca/photon4g for a chance to win a Motorola Photon 4G or a trip for two to a Live NationÂ® concert of your choice2.